I have no words to express the feeling of watching your parent fight for their life, and not being able to do anything. I couldn’t stay helpless anymore. As soon as we found out that a liver transplant could save him, I made the decision to be a living liver donor to my father. But my family can’t afford the transplant, and so we seek YOUR support. A few years ago, my mother was diagnosed with a brain tumor, which came as a shock to my family. 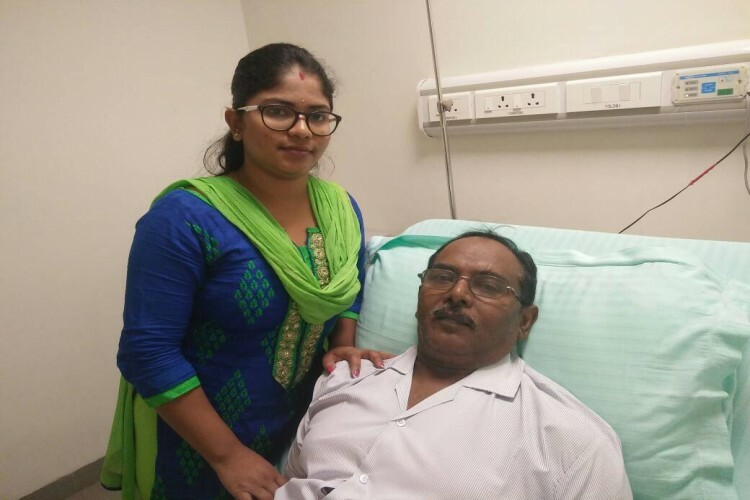 With tests, hospital visits, and medical bills taking over our life, my father, Mr Rangaiah, made a bold decision to opt for voluntary retirement so that he could stay at home and look after my mother who was valiantly fighting cancer. Over a course of time, my mother had to be operated 3 times because the cancer kept coming back. When the cancer was finally gone, we were relieved that she was safe and happily recovering. For my family to have come out of the trauma of my mother fighting for her life, was the most comforting thing in the world. In the midst of all the confusion, my father developed a liver condition. The doctor we visited said it was incurable, and prescribed 2 tablets to manage the disease. Since we lacked the medical knowledge, we trusted the doctor’s expertise. But that was a huge setback. It was only when his condition started to worsen every day, that my brother and I decided to get a second opinion. Dr. Kaiseraja in Aster CMI hospital informed us that my father was suffering the final stages of liver cirrhosis. For the last 1 year, he has been undergoing treatment for the same, but the doctor believes that the last resort to saving his life is a liver transplant. My father has made innumerable sacrifices for our family, so the fact that I could do something to save his life, led me to take the decision of donating my own liver. After an assessment, we were found to be compatible. It finally felt like the problems were going to be over soon, but we were informed that the cost of the transplant would be INR 22,00,000 which was well beyond our means. I come from a middle-class family in Bangalore. My father worked as an administrative assistant and mom was a homemaker. The only breadwinner is my brother, but he can’t put together such a huge amount single-handedly. A large sum of the family’s savings were exhausted in the 3 operations that my mother underwent for a brain tumor. Since we don’t own any properties, getting a loan is also beyond us. The only way to save my father is by having this transplant done in the next 2 months. While the hospital has decided to do the surgery for a subsidized cost, we still can’t afford it. I appeal everyone who is in a position to donate some amount of money towards the transplant, to help us out with their generous contribution. All donations big or small will make a huge difference in saving my father’s life. I request every reader to share this campaign on Facebook, Twitter, Whatsapp, Linkedin, and Google+, so that we can spread the word and raise funds faster. Please donate and share generously. On behalf of my father and my entire family, I thank you all for your contributions. Your share could be as good as a donation for Rangaiah! Not everyone can afford to take care of their loved ones. Rangaiah's life can only be saved by donations made by kind people like you.